Interior design is about more than just taking up space. It’s about maximizing the space efficiency and comfort features of your home. The Brookings media console and fireplace furniture by Dimplex aims to meet needs for style, efficiency and coziness. Anymore, families don’t gather in the evenings to read and sit by the fire. Instead, they gather around the television to watch an evening news program or comedy show. So, Dimplex is bringing the cozy factor of a fireplace to the central location of a home: the media center. 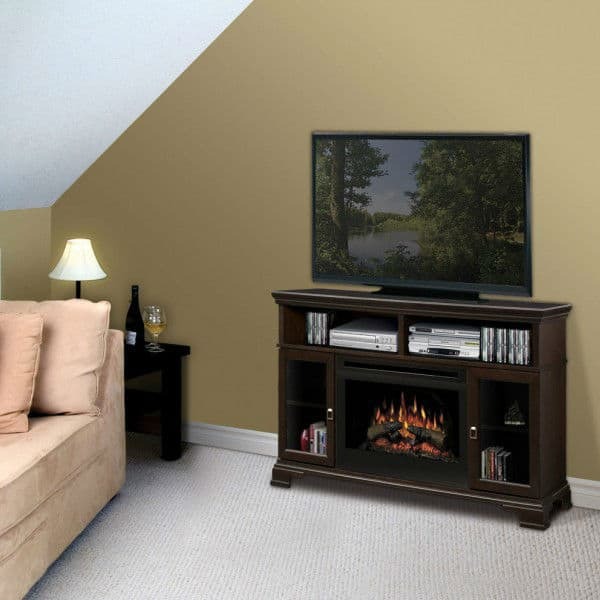 And the Dimplex fireplace is much easier to manage than a traditional wood burning fireplace. It turns on and off with the flick of a switch. You may engage the faux flame visual show at any time to watch flames dance atop a bed of Dimplex’s Realogs. Or, you may engage the fan-forced heat source to blow an air of cozy warmth into your living space at the velocity you desire. Or, you may engage both or neither. Fire up the old evening news, engage the warm and cozy fireplace, and settle into your favorite spot on the couch.